The process of changing a motorcycle never ends; or at least for me it doesn’t. I try to stay constantly alert to upgrades and improvements I can do to my motorcycles in order to make them better serve my needs. Here are some of the minor changes I’ve done to the Honda. I ride a lot of pavement (more than I really want to but that’s the price of living in a major city) and I don’t particularly enjoy the wind blast when riding extended distances at highway speeds. The constant rearward pressure of the wind makes the ride less enjoyable and comfortable. 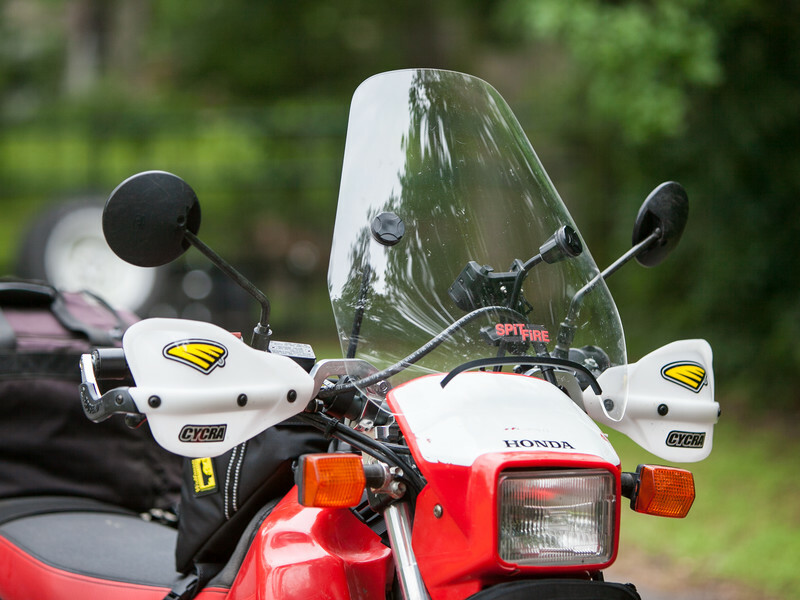 To mitigate this issue I installed a Spit Fire Slipstream wind screen on the Honda. 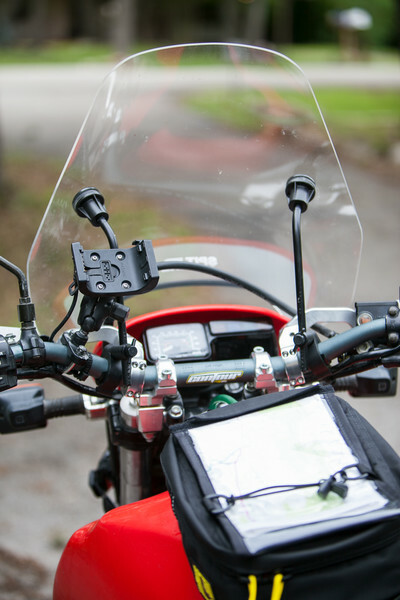 In line with my desire for modular design (items that are easily and quickly installed and removed) the windscreen bolts to the handlebars with a couple of clamps. 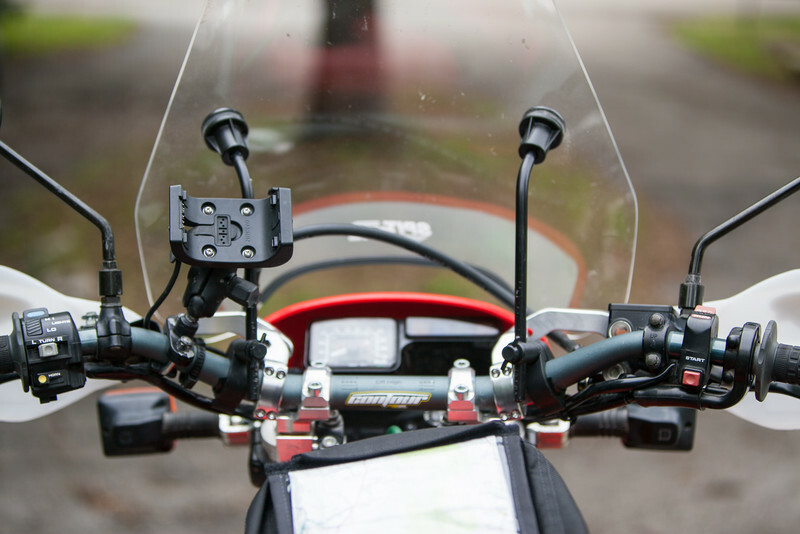 The handlebar clamps stay on the bike all the time but the windscreen can be remove (or installed) in about 30 seconds. 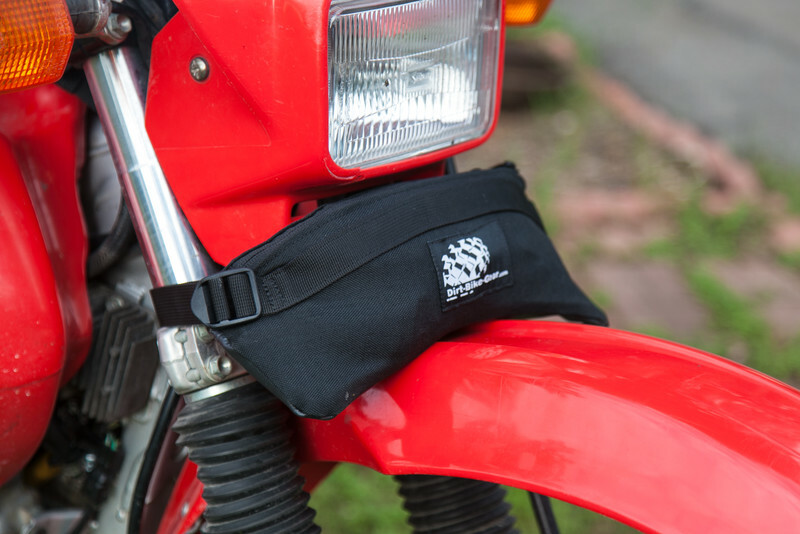 I can quickly install the windscreen if I know I will be riding pavement or pop it off when I am riding dirt. 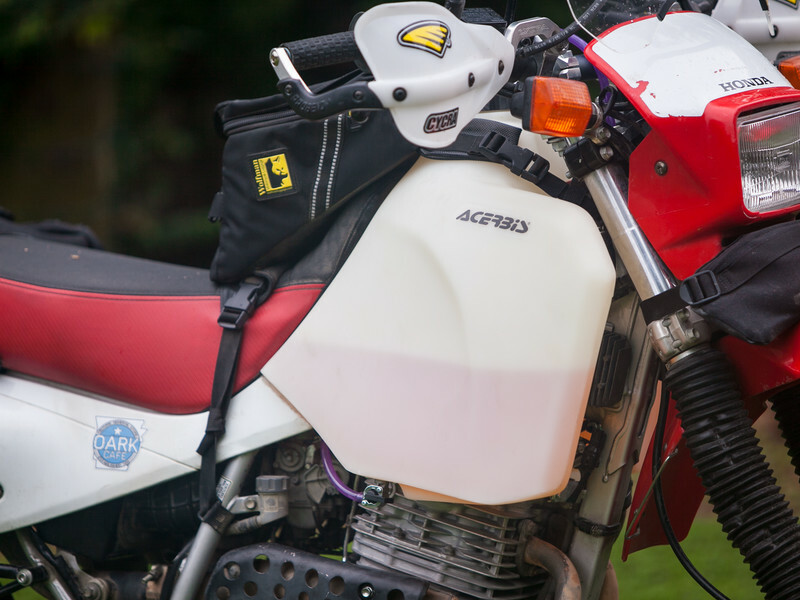 During a multi-day trip consisting of both pavement and dirt it would be simple to rig up carrying straps on the back of the bike so that I could alternate between having the screen on the bike or strapping it on top of my rear luggage bag. I used the windscreen during a 7 day, 1500 mile dual sport ride in Mexico and it was fine on the dirt portion of the trip. Still, I would have preferred to ride the dirt without it so on my next long trip I will have a set of straps with me so I can secure it on the back of the bike. In terms of effectiveness on the highway, the Slipstream does a great job. As good as any windscreen I’ve ever had on any dual sport adventure bike I’ve ever owned. All motorcycles have different designs and geometry and, therefore, handle the wind blast differently. My DRZ was the worst – its design and geometry funnelled the wind directly into the rider’s torso. And no matter what windscreen I tried I was never able to find one that was completely adequate. In contrast, the stock Honda does a great job with the wind. The rider gets an even flow of wind over the entire body, with no one part of the body getting more than wind than another part of the body. The addition of the Slipstream makes it even better. The wind pressure on the torso is removed and you don’t get any helmet buffeting. So far I’ve done one 300 mile day and one 400 mile day with the Slipstream in place and couldn’t be more pleased with its effectiveness. 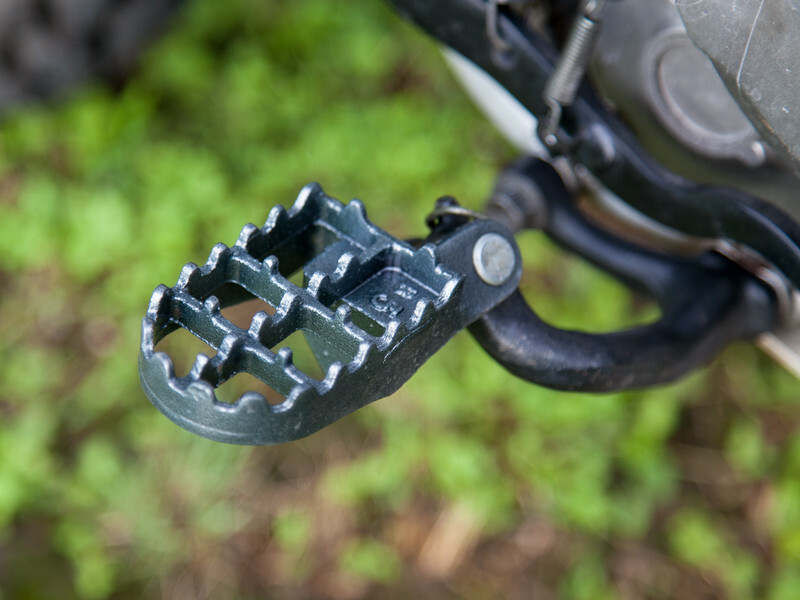 The stock XRL foot pegs are quite narrow and not very good for standing on for long periods of time. If you ride dirt you know that you tend to spend a lot of time standing up. IMS makes a set of aftemarket pegs for the Honda that cost about $90. Pivot Pegs also makes a pivoting set that sells for about $170. However, you can also buy no-name aftermarket set from ebay for about $15. I wasn’t sure how durable a set of $15 ebay footpegs would be but other XRL owners have bought them and I had not read any bad reports so I decided to give them a try. They mounted up easily and fit perfectly. I don’t have any complaints with them so far. I’ve used a fender bag for years to carry my spare tubes. The bag clipped to the front fender with J hooks, as you can see in the photo below. The challenge with this set up is that the bag can fall off. No matter how tightly I strapped it down the bag would sometimes fall off. It didn’t happen very often but even once was more frequently than I wanted. My buddy JT found a fender bag with a different design. 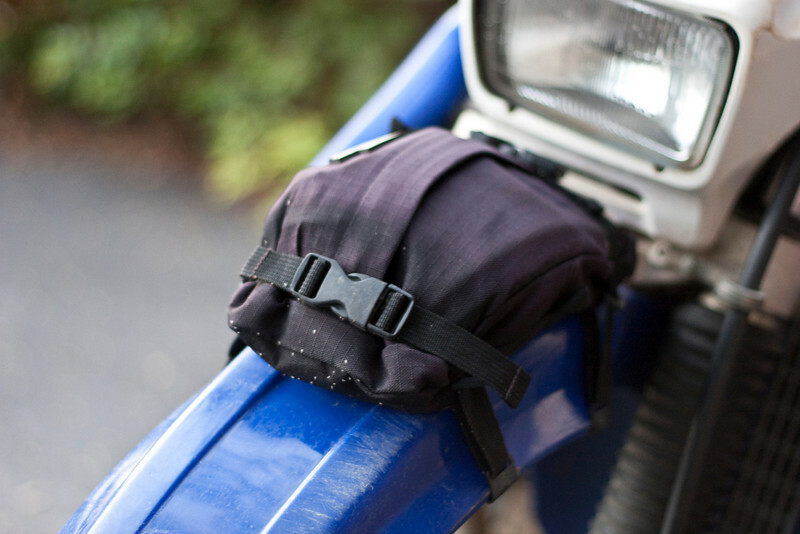 This bag, sold by dirt-bike-gear.com, strapped to the upper fork tubes – meaning the straps would have to break for you to lose this bag. I liked it so much I bought one for the Honda. It does a fine job. The one downside is that it is smaller than my previous bag and I can only fit one spare tube in it. I carried both front and rear spare tubes in my old bag. Still, the security of knowing I won’t be losing it offsets the smaller size. 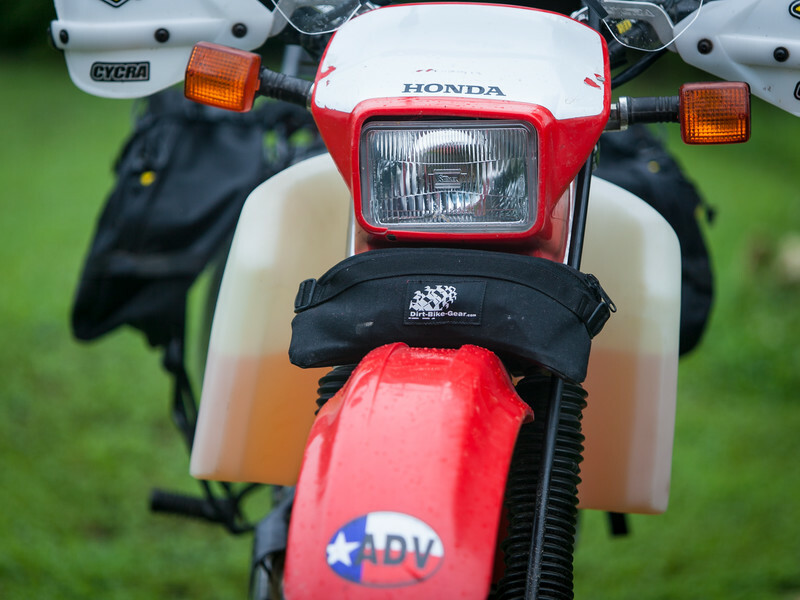 I run hand guards on my motorcycles so that I’m less likely to break a lever when I drop the bike. And, even though I don’t ride in the woods often when I do I know my hands will be protected. 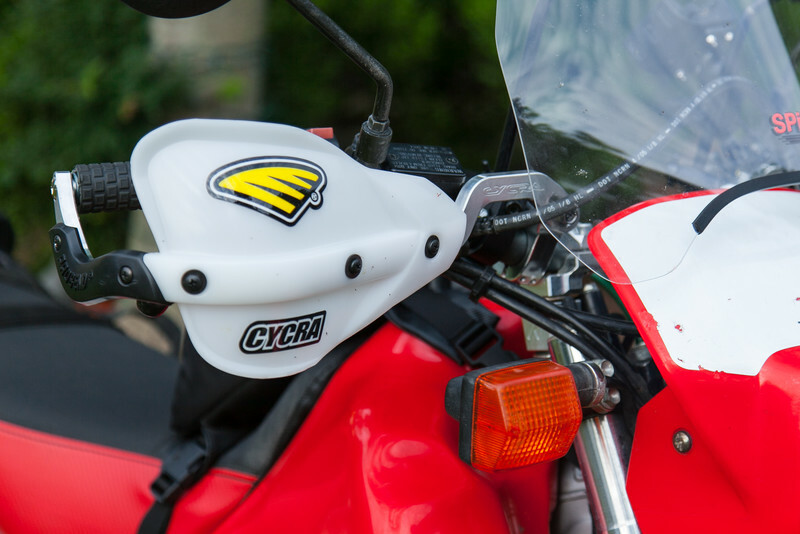 I’ve used Cycra hand guards in the past and found them to be good and stout so I got a set for the Honda. Big Red doesn’t get very good gas mileage. I usually average in the 40-42 mpg range riding a mix of dirt and paved roads. I’m not a hooligan on the bike so I rarely do a full throttle acceleration. On the other hand, I’m not just poking along either. Call me an average rider riding at an average pace. When I ride at highway speeds loaded down with gear fuel mileage drops to about 38. When I’m riding dirt and not getting over about 50 mph fuel mileage goes up slightly. But the variance isn’t a lot. The previous owner installed a 4.7 gallon IMS aftermarket plastic gas tank. It wasn’t ugly but it didn’t add to the looks of the bike either. It worked just fine and gave me about a 180 mile range. My personal preference is to have a minimum of a 200 mile range so I decided to install an Acerbis 5.8 gallon tank. This tank is a better looking tank, to my eye, and it gives me about a 230 mile range. The XRL doesn’t have a fuel gauge so I got the “natural” color to be able to visually determine how much gas remains in the tank. 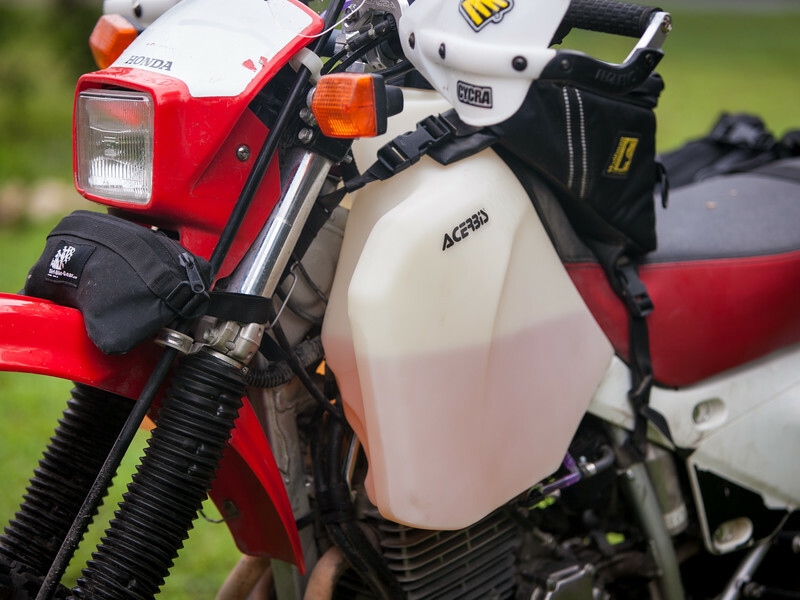 The Acerbis also comes with a petcock on each side of the tank, which is handy for getting the final bit of fuel from the right side of the tank. The Acerbis also required the blinkers to be relocated higher on the triple clamps which wasn’t difficult to do. Overall I’m pleased with this tank. As of now, Project XR650L Adventure is done. Sure, I will likely continue to change things as time passes but the big, major changes are complete. So, what is the verdict? Was the project successful? Read my answer here. Hello Rich. Very nice build thread. I enjoyed reading it. Question: I purchased this same tank for my ’09 and when the bike is in a left turn, slightly before the stop, the bottom of the triple clamp (left side) hits the tank. The right side has minimal clearance, but it does not touch the tank. Did you run in to anything like this when you installed your tank? I didn’t notice the triple clamps hitting the tank but I didn’t specifically check it either. However, shortly after I installed the IMS I also installed a windscreen from Turbo City. The brackets on the windscreen definitely hits the inside of the IMS tank at full stop. It hasn’t been an issue for me so far as I rarely have the handlebars at full stop while riding. Care to share which bikes used the lower 2nd and higher 5th gear? I’m stuck in a part of the world where the dealers are not as knowledgeable as one could hope to find. Great report on the build, thanks for the tips. The 2nd gear is available in the U.S. off the 1989 NX650. The part number is 23421-MN9-010. The fifth gear is European only on the later NX650 and the FMX650, part number 23491-MW2-780. You can’t buy the 5th gear from a US Honda dealer (they won’t list it in their parts catalog since that year model NX650 and the FMX650 weren’t sold in the USA). I ordered mine from Japan but have since seen them for sale on ebay and Amazon (http://www.amazon.com/Honda-Genuine-23491-MW2-780-Countershaft-FMX650/dp/B00TLBCG1K). I have the Acerbis 5.8 and I don’t see how it could possibly fit over those frame mounted rubber bumpers. They look like they’re about 1/2″ too wide on each side. I’ve heard that it takes 2 people to install it. Did you have any trouble installing yours? Have any advice for me? My tank was difficult to install the first time. I had a similar experience with the tank being narrow and tight. I let the tank heat up in the sun and then man-handled it on. I was able to mount it with the frame mounted rubber bumpers. Since then, the tank has conformed to the bike and easily goes on and off. My only advice is to get the tank as warm as you can, which should make it easier to get on the first time. Hi – what was the model number of your Spit Fire Slipstream wind screen? I used the Slipstream S-06 model, though other models would likely work. I found your post very helpful. 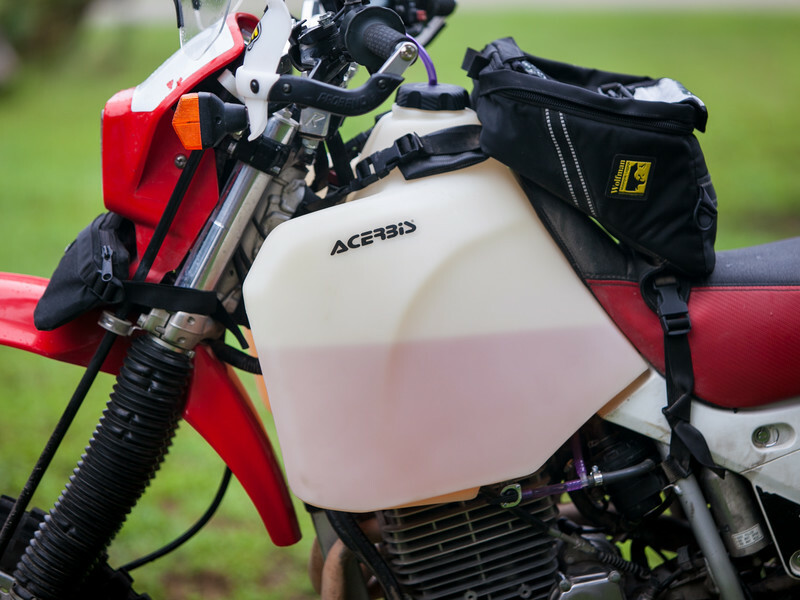 I am the owner of a 2004 Honda XR650L and want to install the 5.8 gallon Acerbis tank. I am having issues finding a tank that fits a 2004. 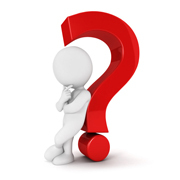 Can you tell me where you purchased your 5.8 gallon Acerbis tank. 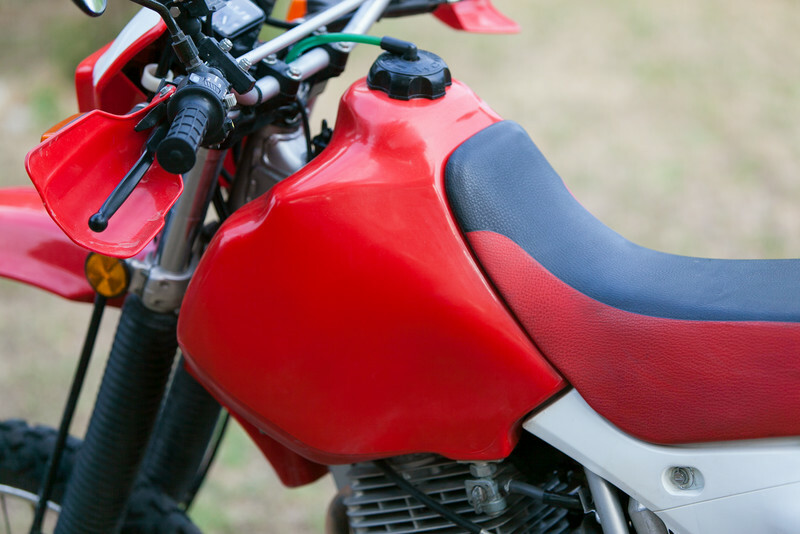 There is no difference in any year model XR650L gas tanks – i.e. any year model will fit since all year models of the Honda use the same gas tank.